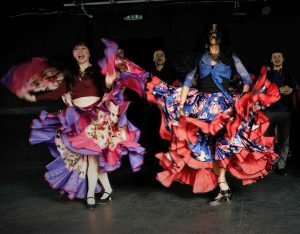 Russian Gypsy Dance is the youngest, the most vibrant and expressive type of Gypsy dances in the world, and is one of the most developed along with one of the oldest Gypsy styles – Spanish Flamenco. 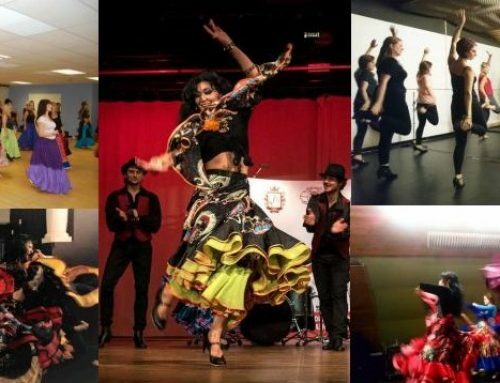 If you take a closer look at gypsy dancing in Europe, you will see that three main types of Gypsy dancing are well developed: Russian, Balkan and Spanish gypsy dances. The other gypsy groups, of course, also have their own dances, but these are less well-known and formalised. Not many dances in the world compare to the Russian Gypsy dance in their passion, unlimited energy and the bright colours of their costumes. Romany/Gypsy people are eternal nomads, which is why the elements of Celtic, Balkan, Indian, Arabic, Turkish, Russian and many other cultures are intertwined in this dance style. The Russian Gypsy music leaves no one indifferent. Group campsite dances accompanied by a Gypsy guitar make an unforgettable impression and infect with joy any bystander witnessing the spectacle. Female Russian Gypsy Dance includes intricate footwork, tapping, graceful arm movements, wide skirt swings, shoulder shimmies and floor work. This dance is characterised by a smooth, slow start, with a gradually increasing tempo which results in a lush, fast ending. 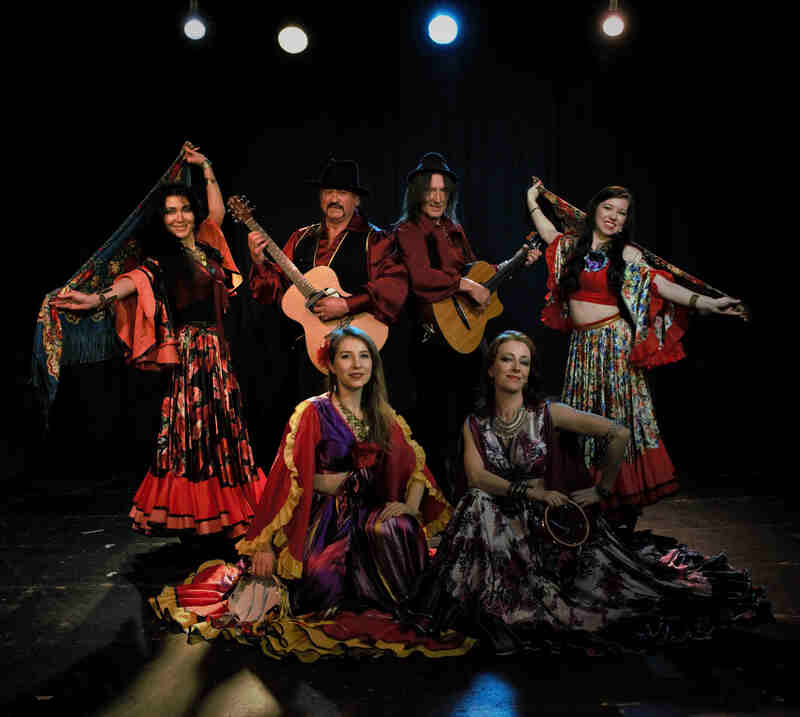 Russian gypsy dance appeared as the interpretation of Russian folk dance in the XIX century and since then has developed considerably, incorporating new elements over time. 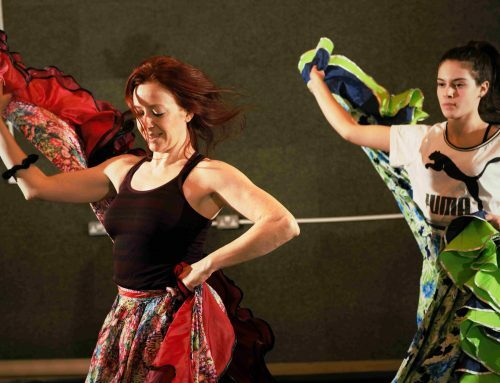 The modern stage version of the typical female Gypsy Dance also includes clicking fingers and wrist movements, like in Flamenco; deflection of the body; and special hair swinging, borrowed from the Oriental/Arabic dance. The male dance is usually fast and energetic. The dancer taps the rhythm with his heels, accompanying it with palms claps on the body, hips, legs and soles of the feet. In many movements  we can see Russian roots. 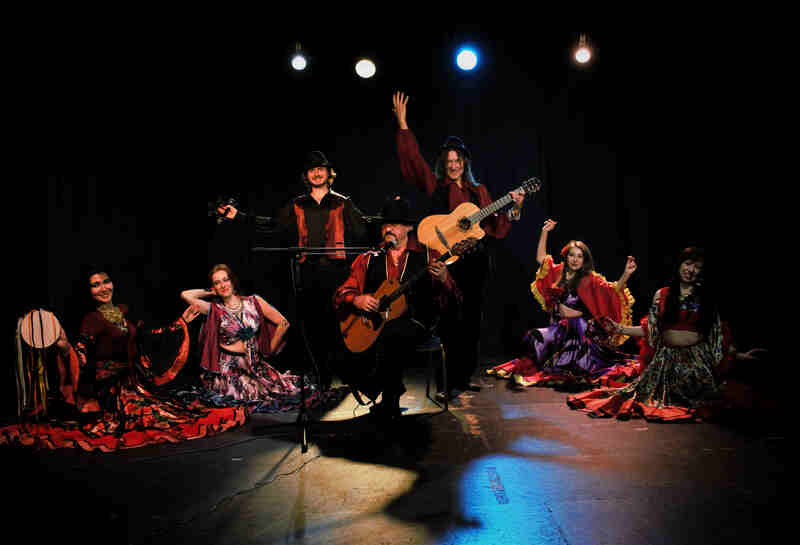 Russian Gypsy Dance is very bright, dynamic and entertaining. All this is usually accompanied by singing, playing the guitar, violin, accordion and tambourines. 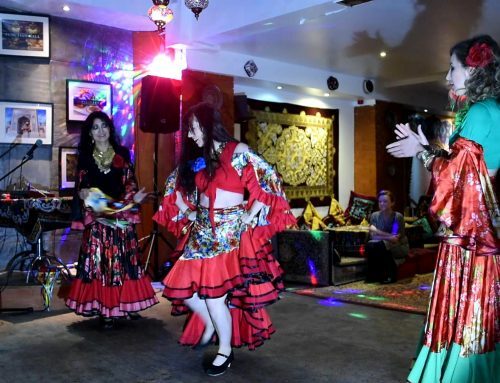 Gypsy dance is energetic and fascinating not only because of its technical side, but also because of its improvisation, freedom, energy and passion. In Russian Gypsy dance performances, the costume also has great importance and is known for its brightness, saturation and vivid colours. Colourful female tops and skirts are dominated by bright colours such as red, black, bright green, yellow, pink and purple. Romany/Gypsy women wear coin necklaces, big earrings, bracelets and flowers in their hair. Dancers tie their waists with a shawl with a fringe or a coin belt on top of the skirt. The skirt is very wide and decorated with ruffles, which allows it to swing, creating waves and curls. It is so wide that it can be easily raised above the head to create a full circle. Men usually wear a silk shirt of bright colours with wide sleeves, tied with a wide black belt around the waist, vest over a shirt, dark pants and a black hat, and shoes specifically for tapping. Usually, men play musical instruments and sing, rarely dance, but they too play a leading role in celebrations. have book-marked it and also included your RSS feeds, so when I have time I will be back to read more, Please do keep up the great b. Thank you for your comment. I am going to post more of the useful information here. I love the Russian Gypsy style most of all Roma dances! 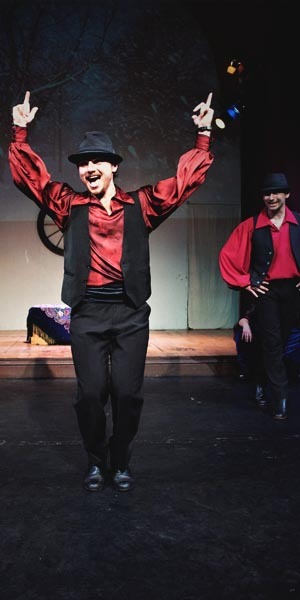 This dance combines in magic proportion – the joy of the Balkan dances, the passion of Flamenco and the energetic assertiveness of the Russian folk! Do you agree? Interesting description from you, i like it))) Flamenco is also a Gypsy dance but by Spanish gypsies)) Russian Gypsy dance is the most developed as a stage form art, that is why it is quite rich in elements.